Help Me Raise $2,178 to Restore the Shuckstack Lookout Tower! Donate One Penny For Every Mile I Hike – Only $21.78 – Click Above! Contributors will be recognized in the sidebar to the right (scroll if necessary). The progress indicator graphic is not updated in realtime following contributions, but rather updates every few days. If you would like to make a contribution by check or money order through the mail, please make checks payable to “Forest Fire Lookout Association” with “Shuckstack” in the memo line. 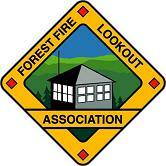 Please mail checks to Forest Fire Lookout Association, 2590 W. Versailles Dr., Coeur d’Alene, ID 83815. UPDATE: First Fundraising Goal Accomplished, Let’s KEEP GOING! As of July 9, we have achieved our fundraising goal of $2,178, or one dollar for every mile that I hike on the Appalachian Trail. This is a monumental accomplishment and one of which that I am very proud. Thank you to everyone who contributed and help make this goal come to fruition. However, let us keep this project on a roll. I have only completed two-thirds of the AT by this date, so my second challenge is to raise another dollar for every mile that I still need to hike to the end. Thus, my second fundraising goal is an additional $800 for a total of $3,000 toward the restoration of the Shuckstack lookout tower. After all, it will require at least $10,000 for a restoration of Shuckstack absent of cost-share programs and additional grants, so we need to keep going! Please help me reach $3,000 to Save Shuckstack! The historic and scenic Shuckstack lookout has suffered decades of deterioration, vandalism, and neglect. The tower has become increasingly dangerous to climb and it is threatened by access restriction and ultimately dismantling and removal by the National Park Service. Please read more about the history, status, and future of this iconic structure on the Appalachian Trail below and help me save the Shuckstack lookout tower by contributing to its restoration above. The Shuckstack lookout tower sits just off of the Appalachian Trail in the western part of the Great Smoky Mountains National Park. Constructed by the Public Works Administration in 1934, its stands 60 feet tall from the ground to its cab floor. The lookout was staffed by the National Park Service, standing sentinel over the nearby forests and mountain peaks that had recently been set aside for the enjoyment of future generations. It was utilized for fire detection through the 1960s, when at that time aerial surveillance became more efficient and replaced use of many lookout towers. With the onset of World War II in 1942, the construction of a large dam on the Little Tennessee River was initiated by the Tennessee Valley Authority (TVA) in an effort to supply electricity for the war effort, most notably for the production of aluminum and the development of the Manhattan Project in nearby Tennessee. The dam was constructed in just under three years – an amazing engineering and construction feat. Crews worked twenty four hours a day using three shifts of eight hours each. The final product, at 480 feet high, was the tallest dam in the eastern United States. With the installation of the dam, the Little Tennessee River was held back to create the 35 mile long Fontana Lake – a 10,230 acre body of water that created 238 miles of shoreline. Nearly the entire length of its northern shoreline makes up the southern boundary of the Great Smoky Mountains National Park. Erected a decade prior to the completion of the dam, the Shuckstack lookout tower and its tower keepers had a rare birds-eye vantage point of the start to finish construction of the massive Fontana Dam. For three years, the site looked as busy as a beehive with ongoing construction at all hours of the day. Upon completion of the dam, the flooding was of Little Tennessee River and subsequent birth of Fontana Lake was visible from the tower. Shuckstack watched from above perhaps the most dramatic landscape change ever witnessed in western North Carolina. Following the completion of Fontana Dam, the Appalachian National Scenic Trail was rerouted to cross over the top of the dam in 1944 and entered the Great Smoky Mountains National Park on the northern shore of Fontana Lake. As this venerable trail climbed up into the Smokies, the first summit that it would reach was an isolated perch known as Shuckstack, named for its appearance when view from a distance. While some say the peak resembles a standing sheath of cornstalks from afar, I have yet to see the similarity! 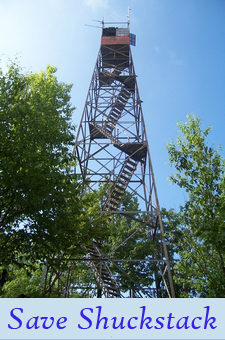 Atop Shuckstack, the trail reached a tall steel fire tower and a tiny, one room log cabin which provided residence the tower operator – up to six months at a time. Occasionally, weary hikers would reach the tower and be invited up to enjoy the 360 degree view from its top; or they might invited into the cabin for a snack or water from the on-site cistern. The NPS used to welcome hikers to visit and climb the towers, where they would be shown the beauty of the surrounding park. In addition to relieving loneliness. The visits were also opportunities to debrief hikers about park policies and forest fire prevention. Shuckstack has been a hiker destination from its beginning. For over 65 years, the Shuckstack lookout has served as one of the best vantage points in the entire Great Smoky Mountains National Park. The panorama includes all of the western Great Smokies, Nantahala Mountains, Cheoah Mountains, Unicoi Mountains, Fontana Dam, Fontana Lake, and the ability to see two states. Its views must be hard earned; the climb to the summit is often regarded as one of the most difficult on the entire Appalachian Trail. While a strenuous hike, the ascent is often overstated. The infamous reputation endures since many long distance backpackers must enter the park carrying a full week’s supply of food and equipment to traverse the isolated section of trail ahead. As you may expect, this increased load makes their climb much more laborious. The 360-degree views from the top of the tower cannot be done justice with description by words. You must experience the dramatic vista yourself to truly appreciate the value that the Shuckstack tower provides to hikers in the Great Smokies. With the exception of Fontana Dam and Lake, the evidence of civilization and human inhabitation are virtually indistinguishable from the tower. The view has remained the same since the tower operator first sat atop this perch scanning the horizon for fire and smoke. Even so, Fontana Lake is exceptionally picturesque from this viewpoint as its arms reach into narrow coves and hollows. One can see the entire western portion of the Great Smoky Mountains range. For northbound Appalachian Trail thru-hikers, like myself, it is the first vantage point of the Great Smokies upon entering the park. These hikers can gaze upon the high stateline divide all the way to Clingmans Dome, the highest peak in the park, and beyond. For Appalachian Trail southbounders, it is the last opportunity to witness the grandeur of these special mountains that they have traverse over the previous week and what was surely one of the highlights of their entire journey. The fire tower is also just a short distance off of the newly incorporated Benton MacKaye Trail, another long distance footpath in the southeast. From Shuckstack, one can see handfuls of other peaks that once supported fire towers jutting out from their summits. The lookout men and women at Shuckstack used to communicate with the lookouts in these distant towers by radio, and sometimes at night using a flashlight and Morse code. However, once these towers were no longer needed following their discontinuation for fire detection, they began disappearing. All of these lookout towers are now gone; dismantled and removed, their views and history are gone forever. Shuckstack faces a similar fate if it continues to fall into disrepair. In fact, Shuckstack’s tower was only spared the same fate of other lookouts due to its use as a National Park Service radio relay point – for which it is no longer used. Use of fire towers in the Great Smoky Mountains National Park was largely abandonded by the end of the 1960s. Though the towers sat unused, the views from the towers were still enjoyed by hikers for over a decade. In a tragic lapse in judgement spured by pressure to restore the park entirely to a wilderness area, the National Park Service removed seven of park’s eleven fire towers in the 1980s. Ten of eleven tower keepers cabin were demolished. Of the four tower remaining, one has been entirely restricted from hikers. Neglected from maintenance and upkeep for over 40 years, two of the other three fire towers (Shuckstack & Mt. Sterling) face similar fates. With its exposure on a high mountain peak 4,020 ft. above sea level, the Shuckstack tower is vulernable to the extremes of weather conditions including rain, wind, snow, ice, and intense sun. Its isolated location makes it a target of constant vandalism. Its steel structure, rivets, and botls have rusted over, weakening its structure. Its wooden planks have rotten and cracked and their bolts have loosened. A handrailing on its initial flight of stairs has fallen off or been stolen, creating a frightening and dangerous climb to the top of the tower. Upon my first visit to Shuckstack nearly a decade ago, I was so horrified by the condition of the tower that it took me nearly a half hour to muster the courage to climb it. It took nearly an equal length of time to reach its top as I ascended stair by stair in a sitting fashion, clutching to the handrails (though they were not always available) in fear for my safety. My hiking companion, so convinced that the tower was on the threshold of crumbling down, opted to remain among the safety of the ground. When I reached the top, I was hooked. The view was out of this world. The experience of seeing our starting location of the hike was rewarding, and the ability to gaze across the great mountains that we would hike across in the coming days was both frightening and inspiring. This moment spur my deep love of the wilderness and mountains as well as my fascination with the history and scenery of fire towers. For decades, this tower was used to protect that land that I now love to explore, where I seek solitude and receive great joy in its treasures. I later discovered that this view and the story of this tower may not last forever. It was rather romantic to think about the job of the former tower operators at Shuckstack. In spite of the overwhelming isolation they must have endured, the men and women who worked in that tower had the best view in the world from the “office”. What amazing sights they must have seen: sunrises, sunsets, dramatic displays of weather, bears and mountain lions, weary hikers, the construction of a dam and creation of a lake…However, they had few people with which to share it. How disappointed they would surely be to see the lookout in its current state. The condition of cab its cab is horrific. Huge gaping holes in the roof allow in rain, snow, and ice. Such constant exposure to moisture has rotted the wood of the interior floor; one can feel its springy softness underfoot and wonder much longer until a visitor breaks through and falls to the ground, or consider if the floor still has the ability to support more than one person at a time before it fails. Its glass windows have been broken by vandalism and blown out by intense winds. Many panels remain shattered, exposing sharp glass, while others are entirely gone and cause more exposure to the elements. The cab’s interior has been apallingly vandalized with graffiti; much its siding has even been ripped from its walls, exposing rotten insulation and expediting the deterioration. Many people think that simply because a structure, especially one cherished by so many, sits within a national park or forest, it will receive attention and upkeep from its administrative agency. Sadly, this is far from the case. Such agencies have years worth of maintenance backlogs and constantly face budget cuts that result in a gross lack of funding to properly care for all if its structures and facilities. Moreover, such agencies are apt to focus what little funding they receive towards more publicly visible projects, such as the repavement of primary park roadwars and campgrounds, high visitor use facilities, and rehabilitation of more easily accessed structures. If the resources were readily available, the National Park Service would undoubtedly restore the Shuckstack lookout tower. Tragically, they are not. Additionally, the maintenance of a structure like a fire tower faces numerous bureaucratic hurdles and management dilemmas. The height of the tower raises concerns about visitor safety and the ever present fear of lawsuits. These apprehensions make the NPS reluctant to prioritize funding to a project with such concerns. It would be far easier to restrict visitor access to the tower to avoid worries about its safety; such practice is extremely common on towers throughout North Carolina and the southeast. As the tower continues to fall into disrepair, its rehabilitation will become exceedingly expensive, adding to the obstacle of already insufficient funding. Ultimately, the lookout may face the same fate as seven other lookouts in the park and countless others in western North Carolina; dismantling and removal. However, fire tower restoration in both western North Carolina and the Great Smoky Mountains National Park is not without precedent. Like Shuckstack, the abandoned Mt. Cammerer lookout in the eastern edge of the park fell into grave disrepair as it went unmaintained three decades. In 1994, a campaign was initiated to restore this historic structure and once again make it accessible to hikers. Like Shuckstack, the NPS failed to see the project as a priority and lacked the funding to rehabilitate the Mt. Cammerer lookout. An independently enacted fundraising effort ensued and the preservation of the fire tower was met with great public interest. The project raised sufficient funding and arranged multiple corporate cooperations to make the lookout restoration possible; the tower was completely rehabilitated and opened to hikers again in 1995. Today it stands as one of the most cherished symbols of the park and one of the top visitor destinations in all of the Smokies. 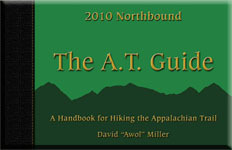 Why Can’t the Friends of the Smokies or ATC help? The Mt. Cammerer lookout restoration became the first project of a group that became known as the Friends of the Smokies. Their fundraising campaign was so successful that they continued their efforts to raise private money to improve the national park that so many hold dear. Today, the Friends are the leading fundraising organization for the park. A common inquiry I receive is to why the Friends do not provide the funding necessary for the restoration of Shuckstack. The answer to this is that the Friends fundraising is now directed at projects prioritized by the NPS; this ensures that private funding can be contributed to those areas in the park that are considered most in need. Naturally, priorities within the park are often different from one person to another. The Friends are an overwhelming positive asset to the park; no amount of public or private funding can reach all of the necessary projects in the Smokies. Please avoid criticizing any organization for how they direct their funding – without them, the park would be in a far worse situation and a less inviting place to visit. However, much of the funds necessary to initiate a restoration effort for Shuckstack must be raised independently of the NPS and Friends of the Smokies. While level of success in private funding is imperative to get this project off of the ground, additional funding is always a possibility in the future as the plans comes together. Opportunity to receive grants from other sources, like the Appalachian Trail Conservancy’s North Carolina License Plate Grant program, may be an option to further the project in the future. Likewise, the NPS may offer the opportunity to enter into a cost share program to restore the tower once enough interest in the project is demonstrated by the public. In this scenario, the federal government may equally match the amount of privately raised funds, in addition to the value of volunteer labor and contributed supplies. The NPS may also determine that the project is worthy of allocation of funding from the Friends of the Smokies or other outside fundraising organizations. In summary, the greater the success of a private fundraising campaign, the greater possibility of receiving additional contributions from these agencies to bring the project to fruition or complete it in the future. Please contribute toward the restoration of the Shuckstack lookout tower by clicking here. My Norh Carolina chapter of the Forest Fire Lookout Association, operating with expenses covered out of my own pocket, has worked over the past two years to raise awareness to the need for restoration of the Shuckstack tower. 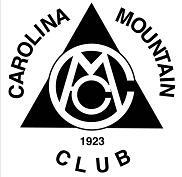 An advocacy campaign has led to numerous newspaper articles throughout western North Carolina, radio and television interviews, and appearances at events hosted by the Friends of the Smokies and Appalachian Trail groups. 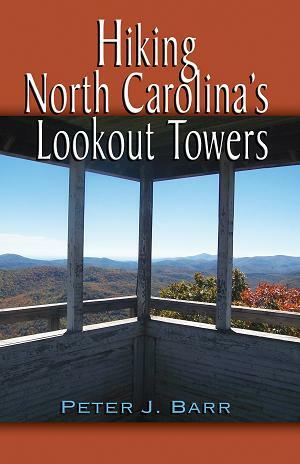 I also authored and released a hiking and historical guidebook covering western North Carolina fire towers and have completed over 30 speaking engagements promoting fire towers as recreational destinations and fire tower preservation across western NC and the southeast. A letter writing campaign to the NPS was also enacted and served to advance the public desire for attention to be given towards the park’s fire tower. Working with limited resources, my FFLA chapter has also raised slightly over $1,000 for the project to date – in advance of my AT thru-hike fundraising campaign. Most significantly, I have begun talks about the process and timetable of initiating a rehabilitation effort at Shuckstack with NPS officials, even hiking to the tower together to assess its condition and discuss its necessary repairs. Because of Shuckstack’s poor condition, the tower faces many needs. However, the foremost priorities and getting a rehabilitation project off of the ground is to not only build public support with advocacy and fundraising, but to specifically inventory the expense of needed repairs to the tower and the extent of structure work it will require. To accomplish this, the tower will need a structural analysis performed by engineers and park officials, an evaluation that will alone require a significant expense. Upon obtaining the itemized tasks necessary to restore the structure and to again make it safe for visitor use and the costs of these repairs, the project can proceed with allocation of future funds to this list of repairs. In addition to funding, the project can benefit immensely from the pledge of donated hardware aterials such as wood, bolts, glass, and sheet metal. To pledge individual or corporate contributions of material supplys, please an email to saveshuckstack@gmail.com. …to initiate the project, and how you can help? You can help get the project off of the ground in two ways. First, contribute to my effort to raise $2,178 towards the restoration of Shuckstack by the end of August. I am hopeful to postively use the attention generated by my Appalachian Trail thru-hike to fundraise for this project so close to my heart. I recommend that those interested in my hike and those who enjoy reading my trail journal contribute only one cent for every mile that I walk. This equals a donation of just $21.78. Ultimately, I wish to raise a dollar for every mile of trail that I hike. Remember, the greater the success of a private fundraising campaign, the greater possibility of receiving additional contributions from these agencies to bring the project to fruition or complete it in the future. These letters should include your desire to see immediate attention given to the rehabilitation of the Shuckstack fire tower. Letters should include reasons why it is a historic structure worthy of preservation as well as a scenic opportunity important to both the Great Smoky Mountains National Park and the Appalachian Trail. Most importantly, please include personal stories involving your experiences visiting the Shuckstack tower and why these make this structure so important to you. Please help me Save Shuckstack! Hey peter, I met you once with Dwight and Gretchen. i am willing to donate to this but need to send check. You are a great example of what a young male american should be. Last fall, my brother and I took our father camping as he had done for us while we were growing up. Without much of a plan, we decided to go for a hike. Dad wanted to see the dam and wanted to hike a section of the AT, just to say he had done it. So we drove to the dam, hiked across, and started the climb into the park towards “shuckstack” on the map, with no clue what that meant. Dad’s knees couldn’t make it very far up the mountain, but my brother and I continued the climb. What an amazing spot. We debated whether to climb the side trail to “shuckstack,” or at least I did. Luckily, we made the right decision. What an amazing reward for a hard climb – the most beautiful vista I have ever seen. I hope to return one day if I ever do a thru-hike. It was simply breathtaking. You’ve got my donation and support for this project. Okay, I’m raising the stakes. A whole NICKEL for every mile, $108.90. The cause is worth it and you’re a great inspiration to us all! I hope to join you in northern VA for a few days. I think I’ll donate (soon anyway). I have hiked up this trail a few times for work (veg management in the park), treating the oriental bittersweet along the trail there, and every day included a trip up to the top of the fire tower! Once, we went up to the top of the tower to eat lunch, when a storm moved in (I don’t think there was lightning but it got crazy windy and was a heavy downpour; certainly could have used some repairs to keep the rain off). That was a bit scary, to say the least! Thanks for what you are doing! Great cause. Love what your doing! Hope to do shuckstack soon. Youve got my support and donation. Keep up the good work! A short video about the shuckstack that I thought you may enjoy.